Media outlets are often accused of having an East Coast bias, and at NFL Films, we have to be careful of avoiding a Philadelphia Eagles bias. Our headquarters at 1NFL Plaza is about 20 minutes from the Linc, ‘Jaws’ and ‘Baldy’ are two of many ex-Eagles who wander the hallways and do their film work at our facility, and there are dozens of producers, cameramen, and staff who are from the area and root for the Birds. We also interviewed Troy Aikman, Mark Schlereth, and Mike Golic, among others, and they all said the same thing: this was a great defense, and its two best players were on the defensive line: Reggie White and Jerome Brown. Our film is a story about two athletes dying young–Jerome at 27 in the prime of his career and Reggie at 43 when he was just five years removed from playing football. But we didn’t want to make a show that was 99% football highlights then wrap it up in the final minute with a somber narrator lamenting that these two were gone too soon. These guys were more than sporting icons—they were someone’s husband and father and brother and son, so in this show you’ll hear from Reggie’s wife and Jerome’s sister, both of whom spoke lovingly of their lost loved ones and with affection about the close relationship between the two players. Reggie and Jerome were men in full who were robbed of full lives, at least as measured by their stay on earth. But if you measure a life based on the love a person leaves behind, then these two guys lived a long, long time. You could even argue they’re still around. 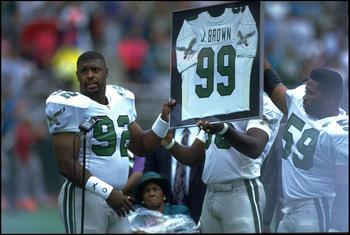 – You will not believe how Reggie White received the news of Jerome’s death. 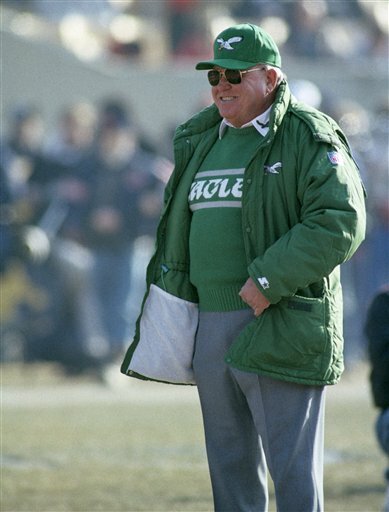 – Both sides [Eagles management and Reggie’s agent] disagree on whether Reggie was offered a contract by the Eagles before he left as a free agent in 1993. – Both players were so beloved that everyone said ‘yes’ to interview requests; we tallied 30 sit-downs totaling nearly 40 hours. – No animals were harmed during the production, but at least 500 Starburst candies gave the last full measure of devotion. The series will continue next Thursday, September 29th at 10pm/ET with “Reggie White and Jerome Brown: A Football Life” on NFL Network.